10 Great Books for Mother-Daughter Book Clubs - a "Best Book List"
Ask any teacher or literacy expert — reading with (and to) your kids is the best way to guide them into a life of reading on their own. But we don't just read to our kids to create literate people. We read with our kids to create a language with which to talk and think about life. Kids — girls, especially — are under loads of pressure. Pressure to be good students, to be popular, to be athletic, to be responsible, to be accomplished. Their lives and relationships are complicated, yet it's often difficult for them to talk about these complexities with their parents. Reading books with our kids gives us a concrete way of discussing life's quandaries. This list is particularly created for moms and their kindergarten through high school daughters. Whether you are one mom reading a book with your daughter or a group of moms and daughters reading and discussing together in a book club (what fun! ), the books listed here provide plenty of opportunities to discuss the minor and major choices we all face in life. Moms will be able to dispense their wisdom, veiled as plot analysis. More importantly, moms will be deeply impressed by how wise and articulate their daughters can be. Reading together is fun, and it can bring people to a deeper understanding of each other. Think your daughter's too young to have a conversation about gender roles? She's not. 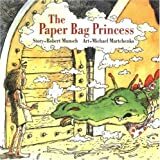 Books like this one, a dear anti-fairytale about a princess who comes to her own rescue, can springboard the conversation. Young girls will intuit the difference between this story and more traditional princess tales, even if they don't have the language to articulate what they're noticing. That's where you come in, Mom. As Will Smith once said, “Parents just don't understand.” Ramona, I think, would agree. She's a lovable heroine, if sometimes somewhat trying for those around her. She's the precursor to the Junie Bs and the Olivias of the world, the original trouble-makin' heart-breaker. The most wonderful thing about the characters in this book is how real they are. All the characters – not just Ramona, but the parents and sister Beezus, as well – are truthfully and lovingly rendered. The family's struggles are also true to life and, best of all, highly entertaining. Once you fall for Ramona, you and your daughter might not stop until you read the whole series. Friendships can be tricky at any age, but especially when one is simultaneously navigating the treacherous waters of middle school. Author Dowell nails the feeling of being eleven, wanting things to stay the same even while nothing around you seems to want to stay put. The two main characters Kate and Marylin deal with divorce, new friends, cheerleading, boys, and insecurity, all of which test the strength of their life-long friendship. I love that the story does not wrap up neatly at the end. The book might help to open a conversation about choosing friends who bring out the best in us, and about letting people out of our lives when their presence is hurtful or destructive. Four friends are about to start the summer before their junior year of high school, the first summer they've spent apart. Though the girls are far away geographically, they stay close and lend support through phone calls, letters, and, of course, packages containing the magical thrift-store jeans that somehow fit (and flatter) all four girls' very different bodies. The four girls give Brashares a perfect way to incorporate a variety of realistic challenges – including divorce, crushes, loyalty, self-esteem, and, of course, friendship. Young readers will enjoy the humorous writing style and relate easily to the characters, while moms just might remember for a moment what it's like to be sixteen. This book is a captivating time capsule, bringing to life the joys and trials of life in Brooklyn at the turn of the century through the character Francie Nolan. Francie is one of the most endearing characters I've ever read and, though she faces heartbreak and poverty, the qualities that define her most are strength and gladness. In fact, Francie comes from a line of strong women, women who refuse to be beaten by life, who insist on cracking open the stones to find the gems. The relationship between Francie and her mother is almost too real, both fiercely imperfect and fiercely loving. A wonderful read, and an honest portrayal of complex relationships. Katsa is a warrior. In fact, she's practically unbeatable, since she's one of the graced — people born with skills far beyond any normal abilities. Katsa is forced to serve as henchman for her king, enforcing his laws with brute strength. Not until she meets Po, a warrior from another kingdom, does she begin to see any advantage to her abilities. Just when she discovers the exhilaration of using her power for her own ends, Katsa also has to face questions of freedom, responsibility, and love. Cashore's world is fantastical and compelling, but it's Katsa's struggles – universally recognizable to women – that make this book such a powerful read, especially for mothers and daughters, who themselves are usually on opposite sides of life's critical decisions. Author Halse Anderson has many wonderful books for young girls that are compelling reads for adults, as well. In this book, Lia has just discovered that her former best friend Cassie has committed suicide, and that she herself ignored Cassie's thirty-three phone calls on the night of her death. Lia struggles with her grief and culpability, which send her spiraling back into the anorexia for which she's been treated in the past. Wintergirls can be difficult to read at times, because of the intensely emotional content. The intense, real emotions are also what make it such a powerful book. Lia's parents understandably want to ignore what she's going through, unintentionally leaving her to suffer in isolation. They do redeem themselves in very realistic, touching ways, offering a portrait of parenting at its most challenging. Woodson has a gift for weaving issues such as racism, abuse, and sexuality into her stories without sounding preachy or making the stories about the issues. She simply tells stories with realistic characters who happen to be dealing with these societal issues, as many people do. In If You Come Softly, two teenagers – Ellie, a white girl, and Jeremiah, a black boy – meet at am elite prep school and fall in love. Even Woodson's foreshadowing that things won't end well for the pair doesn't stop the reader from being swept up in the intensity of their feelings for each other. The story provides ample opportunity for readers to talk together, and to share their own experiences with race and prejudice. While girls today face many pressures when it comes to finding and keeping love (just check out the self-help section of your local bookstore to discover many variations on "the rules"), modern girls have nothing on those in Austen's world. The rules about class and socializing are subtle, and Austen portrays the players, who have made socializing, gossiping, and finding husbands into full-time jobs, with wit and (mostly) affection. Despite the emphasis on finding rich husbands, Elizabeth Bennett manages to be a girl who defies convention, first by attracting Mr. Darcy even though she's more interesting than she is pretty and, then, by rejecting him because she decides she can't love him. It's a fun read, and worth the re-read for mothers, especially if it means you can get your daughter to put down Gossip Girls for a while. Put aside your snobbery for just a moment. There's a reason why the books in the Twilght saga are such a phenomenon: they're fun to read. Many a mom agrees with me (um, they're called “Twi-moms,” but feel free to eschew the silly moniker). Reading these books with your daughter gives you the perfect excuse to indulge.